This weekend I was hit with a virtual avalanche of spammers on both the Forum and Blog comments. They all came with varied (and apparently random) gmail addresses. I ended up spending many hours personally deleting several hundred postings and blocking (one by one) over one hundred gmail addresses. Finally, rather than put into place more stringent requirements for registration - something I may have to do later on - I simply blocked all gmail accounts. If you have a gmail account, you probably can't post or comment right now, and probably can't register. If you have an alternate email, please use that. If you only have gmail, please email me and let me know; it would be helpful to know if many real people are affected by this. Sorry for the inconvenience! A lot of beginning/intermediate players tend to push back any serve that comes at them slow. This is fine at the beginning level where backspin serves come at them slow, while topspin serves come at them faster. At the higher levels, this is not true; intermediate players can serve with sidespin and topspin that goes out slowly, since they've learned to graze the ball, and so most of their energy goes into spin. And so if you push these serves, the ball flies off the end or to the side. The problem is that beginners get it ingrained that they can push a slow serve, when they should be reacting to the spin, not the speed of the ball, and pushing only against backspin or no-spin balls. How do you teach them to break this habit? Had a fascinating time watching these two train together yesterday as they prepare for the U.S. Open. Sun (rated 2730) is here for much of the summer, and is seeded fourth in Men's Singles at the Open (which starts in about a week), while Jeffrey (2612) is almost the same level - he's way out of practice, as he lamented during his first serious practice session in some time. (That's what happens to players who become coaches.) They spent most of the session taking turns feeding multiball to each other. How many of you do that, as opposed to just hitting? Yes, I'm talking to you, the aging table tennis player reading this article. Or the young but lazy one. You both have the ability to move when you play, but you don't do it enough. Sure, you gradually slow down as you age, and so many older players become more backhand-oriented rather than attacking with their forehand, which takes more footwork. Sure, younger players may find that if they use less footwork and simply stand at the table, they won't get caught out of position. Both of these are defensible positions. But guess what? The loss of footwork begins with a single non-use of your footwork. The more you don't use footwork, the faster you lose it, which gives you more reason not to use it, which accelerates the loss of footwork, which . . . you get the idea. If your goal is to challenge the best players in the world, then you want to play the best possible style. But for anything less, almost any style will do. One of the ironies of coaching is that if certain styles have a 1% advantage over another, then nearly 100% of students are taught those styles. After all, who wants to be the coach that teaches someone an "inferior" style? And so very few new players are taught to be choppers, long pips blockers, pips-out penholders, hardbatters, the Seemiller (or American) grip, and so on. These aren't considered the "best" styles, and so almost nobody teaches or learns them. Is there a place for these styles? Supernova or brightly burning star for many years? One of the toughest things to do in table tennis (or any skill sport) is to do exactly what the heading says - "Let go, Have fun." 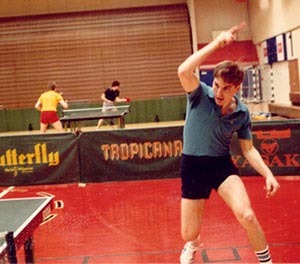 In a split-second skill sport like table tennis, you can't consciously control each shot; it's all instinctive. Yet that's exactly what one does when they can't relax. And so all their instincts go out the window, and suddenly they can't make a shot. Afterwards, they wonder why.